When searching for a tablet that will fulfill your daily needs, there is a huge chance the decision process involves either the Galaxy Tab or iPad. They are both phenomenal performing tablets, but most people can’t afford to purchase both these top performing devices. If you’re similar to the average consumer, processing specifications probably won’t have a huge factor in your purchase, but rather the size and overall looks of the tablet will. Read on as we continue to battle these two tablets head-to-head in effort to find their strength and weaknesses. The iPad runs iOS, which is Apple’s proclaimed self-explainable operating system. It’s generally very fast at running applications and switching between them. Most applications are setup to run on the iPad without being stretched out of their native resolutions. Also, the user-interface is very easy to navigate – even young kids are able to understand their way around the device. Furthermore, iOS is usually the first mobile operating system that developers release their applications to. Android also has its share of positives too. The ability to multitask on Android devices is flawless compared to any other operating system. I also have felt that the notification center is more organized than iOS. Oh, I also am in love with the freedom to place widgets literally anywhere I want on Android. The Google Play Store even has plenty of applications to choose from, I believe they are slowly catching up to the amount of applications available for iOS users. Let’s put it this way, the iPad’s retina display is much more dense and sharper than the Galaxy Tab, however the AMOLED display on the Galaxy Tab hands down defeats the iPad when in the sun. Screen glare kills satisfaction, and an AMOLED display prevents that from happening. 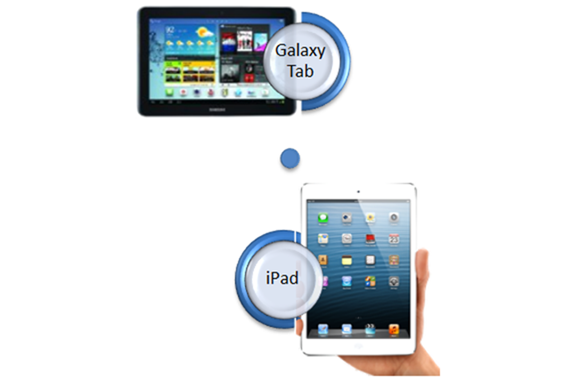 Just keep tabs that the Galaxy Tab screen resolution is nowhere near that of the iPad. The iOS App-Store and Google Play Store offer many of the same applications. Many well-known applications like Angry Birds and Dropbox are nearly guaranteed to be released on both platforms because developers are looking to cover the whole market. One issue with applications on the Galaxy Tab is that they tend to look stretched because they were built for a smaller Android tablet or smartphone. The Galaxy Tab takes this category by a long shot because users are able to customize their tablets to their liking. For example, users can change up font size, color, and even place widgets wherever. On the iPad, users will have to go through the stressful jailbreaking process if they want to personally customize their device. The large 9.7-inch iPad sells at $499.00 for the latest model with the insanely great screen resolution. On the other hand, the Galaxy Tab has a 10.1-inch display and sells for just $299.00! They are to very alike tablets, yet they have huge price margins. Author Bio: Ryan St. Onge is an American technology writer. He enjoys writing about laptops on his blog Fantastic Laptop.